Photographs and details of Knock Castle Isle of Skye. Includes a history of this former MacDonald stronghold and details of the Knock Castle Isle of Skye Green Lady ghost. 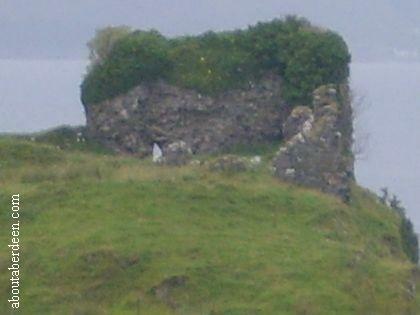 Knock Castle Isle of Skye can be found on the A851 in the Sleat region. Aboutaberdeen.com visited Knock Castle after visiting nearby Armadale Castle Isle of Skye Scotland and Clan Donald centre. Knock Castle is now a ruin as can be seen in the photos. Stones from the castle were used to build nearby buildings such as Knock Farm. We were unable to access the ruins but took the pictures from the main road with views across Knock Bay. Knock Castle is also know as Castle Camus and the Gaelic Caisteal Chamuis. It was once a stronghold of the MacDonald Clan. This 15th century Keep was originally occupied by the MacLeod Clan until captured by the MacDonalds, though ownership was taken by each Clan during the history of Knock Castle. For example in the year 1513 Mary MacDonald (nicknamed Mary of the Castle) helped to defend Knock Castle against attacking warriors led by Alasdair Crotach MacLeod. Scottish ballads are still sung about her bravery. During its occupation Knock Castle was improved in 1596 by the MacDonalds. 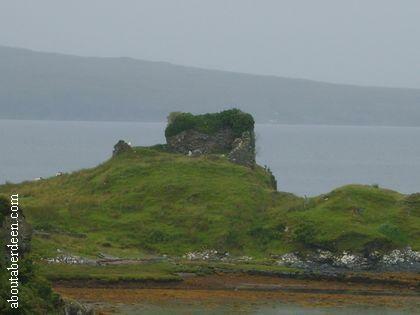 Knock Castle Isle of Skye was left unoccupied in 1689 or 1690 and fell to ruin. Legend has it that the ghost of Knock Castle is a Green Lady. She is said to be a gruagach spirit that will appear when the family of the castle are to receive good news. Should the news be bad then the Green Lady will cry. Some sources consider Knock Castle on the Isle of Skye to also have a ghost that looks after its livestock called a glaistig. There is also a Knock Castle ruins in Aberdeenshire which also has a ghost. Read more on the www.aboutaberdeen.com Knock Castle Ballater page.